This is a turnkey export project for a large reputed Global FMCG leader for a fully automatic high efficiency high purity process water treatment system. The scope of supply includes design, engineering, manufacture, supply, installation, trials, commissioning and training of plant personals. 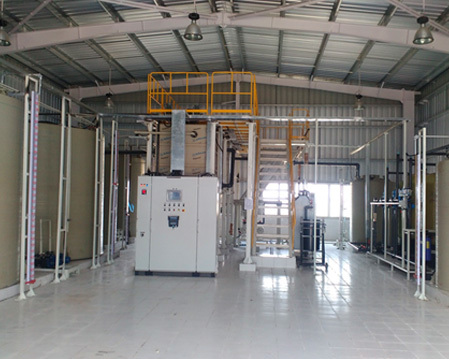 The scope of supply includes 2 stream automatic pumping system, automatic pretreatment systems, Fully automatic PLC controlled two bed “QUICK CYCLE” demineralizers and Regenerant bulk chemical storage and handling system. The skid mounted system was manufactured at our works and shipped in CKD condition for further assembly and installation at site with minimum site work and time. The system requires minimum space, operator attention, uses less water, less chemical and power. The project was executed on time and to the fullest satisfaction of the end user. The Tubular membrane Filtration project is for treating waste water. The system is fully automatic and consists of Reaction tanks, Chemical dosing systems, process pumps, interconnecting piping, valves, Control panel, Tubular membrane filters all mounted on a corrosion resistant anodized aluminum skid with castor wheels for easy portability. The tubular membrane process is unique in the sense it is uses special membranes for filtering the water and waste water. When used as part of waste water treatment it is used for solid liquid separation and replaces conventional clarifiers and makes the treatment process much more efficient and simpler. Process Water treatment is important. More important is how efficiently the water is treated! Our globally well-known Cosmetic market leader understood the importance of efficiency and awarded us a turnkey project. The project was won against stiff competition from large well known global and Indian water treatment companies because of the technology, value engineering, quality and solution offered by Ionic. 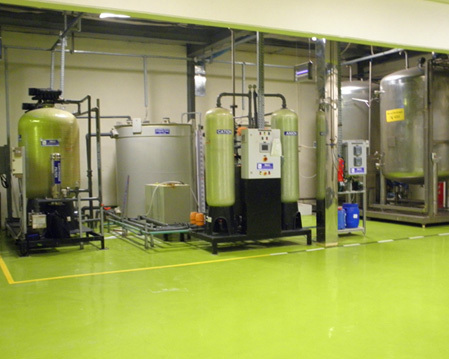 This turnkey high purity process water treatment project was executed for a Global leader in Cosmetics and includes design, engineering, manufacture, supply, installation, trials, commissioning and training of plant personals. The customer requirement was for a fully automatic high efficiency high purity process water treatment, storage and distribution system which will improve operational efficiency and reduce operator involvement. As part of corporate social responsibility and sustainability goals the customer was very specific that the water, energy and chemical efficiency of the system must be very high. Ionic designed the system to ensure that there is overall 86% water efficiency which means for every 1000 litres of feed water 860 litres was purified water and given to the customer for use. 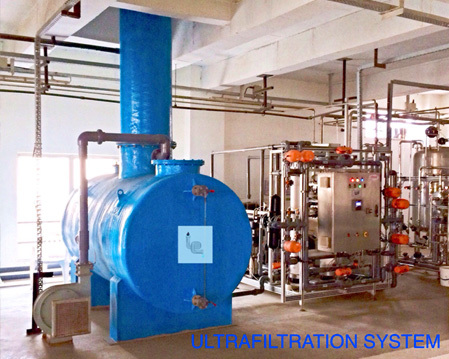 The skid mounted system consists of fully automatic pretreatment system followed by ultrafiltration system and Dual pass fully automatic Hot water sanitisable sanitary design Reverse osmosis system in SS 316 L. The R.O system is designed for high efficiency operation and works at 90% recovery. The RO system uses Ionic’s unique proprietary “MATRIX” real time monitoring system which at any given point of time tells the operator at what efficiency level the RO system is working. This helps the operator in trouble shooting and decision making process as to when to clean / replace the RO membranes. Waste water recovery and recycling system is also is a party of the project which treats the segregated waste water for treatment and reuse. The treated purified water is stored in sanitary ozonated tanks for further distribution to point of use. The Hot and Cold purified process water sanitary storage and distribution loop consists of skid mounted pumps, valves, instruments and controls. Membrane Electrolytic ozone generators are used for continuous disinfection of process water and to ensure very low microbial count which is critical attribute for the customer since the process water is one of the most important ingredients for cosmetics. This is a turnkey project for a large reputed Aerospace company for a fully automatic high efficiency waste water treatment system. The system is designed for treating waste water from anodizing and plating operations and the waste water is highly hazardous in nature. Ionic has executed 3 projects in the past for the same customer for treating water and waste water. The scope of supply includes design, engineering, manufacture, supply, installation, trials, commissioning and training of plant personals. The system consists of Storage tanks, Transfer pumps, Reactors, Smart Digital Chemical dosing system, Lamella inclined plate clarifier, Easy drain The system was pre-engineered with 3 D modelling in latest Autocad Inventer and pre-fabricated and dispatched in knocked down condition to site for further integration in shortest duration. 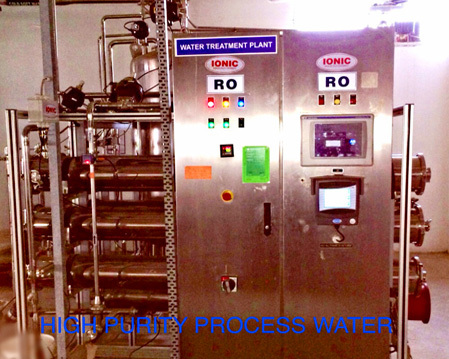 The system uses many innovative solutions and patented technologies to handle various process waste water streams and after the pretreatment-secondary – Tertiary treatment advanced physio-chemical process the treated water is colourless, Clear and Clean meeting all Regulatory requirements for waste water disposal. All tanks, reactors, pressure vessels, piping, valves are of high quality PP-H and UPVC to provide long life and is corrosion resistant and requires no maintenance. The process control is PLC based and uses smart digital online sensor for measuring critical process values. The smart digital chemical dosing systems are PID controlled to accurately dose process treatment chemicals and ensures no under dosing or over dosing of process chemicals. This saves chemicals and reduces operating expenses. This is a turnkey export project for a large reputed Global FMCG leader for a fully automatic high efficiency high purity process water treatment system. The scope of supply includes design, engineering, manufacture, supply, installation, trials, commissioning and training of plant personals. 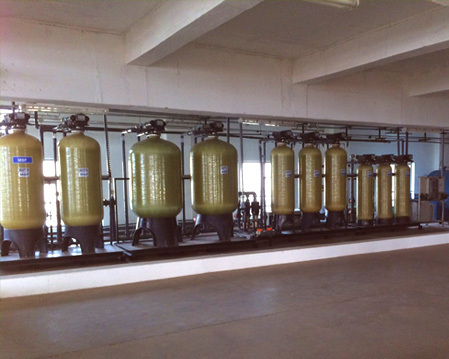 The scope of supply includes automatic pumping system, automatic pretreatment systems, Fully automatic PLC controlled Trio bed “QUICK CYCLE” demineralizers and automatic Chlorination system. The skid mounted system was manufactured at our works and shipped in CKD condition for further assembly and installation at site with minimum site work and time. The system requires minimum space, operator attention, uses less water, less chemical and power.